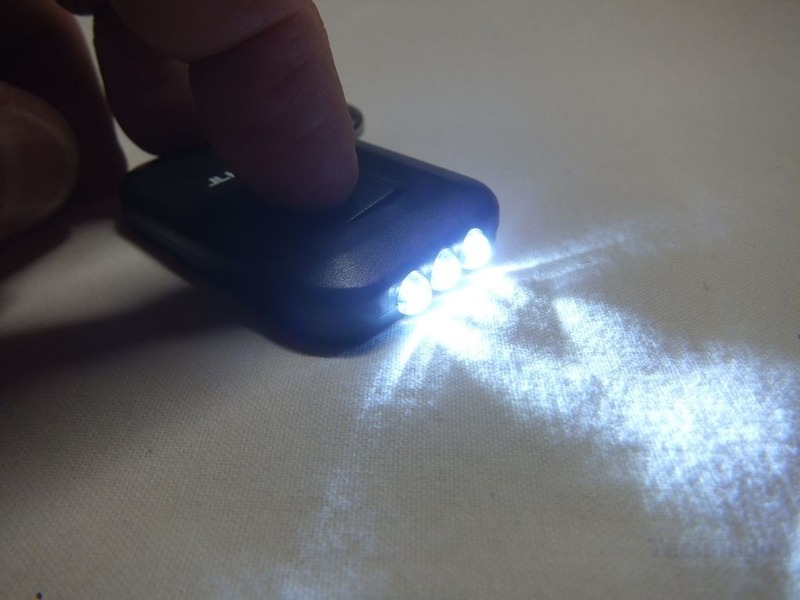 Shed Some Light on Your Work with Powerful and Convenient Flashlights! You never know when you need to rely on a flashlight. If your lights go out and you need to check the circuit breaker, you need to change your computer hardware, or the plumbing in the basement springs a leak, a flashlight can be a lifesaver ! 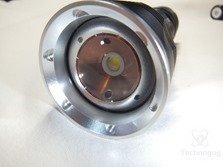 Special Powerful Genuine Ultra Bright XM-L2 T6 Super-Silicon Carbide Single Die LED Chip to achieve a retina searing output of 1200 Lumens. 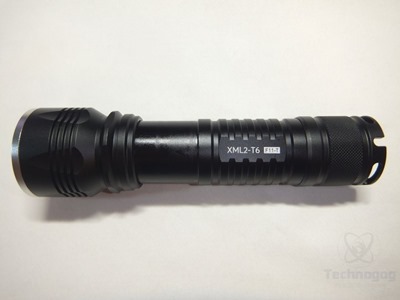 The LED flashlight is made of High Quality Aluminum alloy 6063, CNC Machined Body, Hard anodized finish for extreme corrosion impact, IP65 waterproof for using in heavy rain. A vast improvement on the original wall charger. 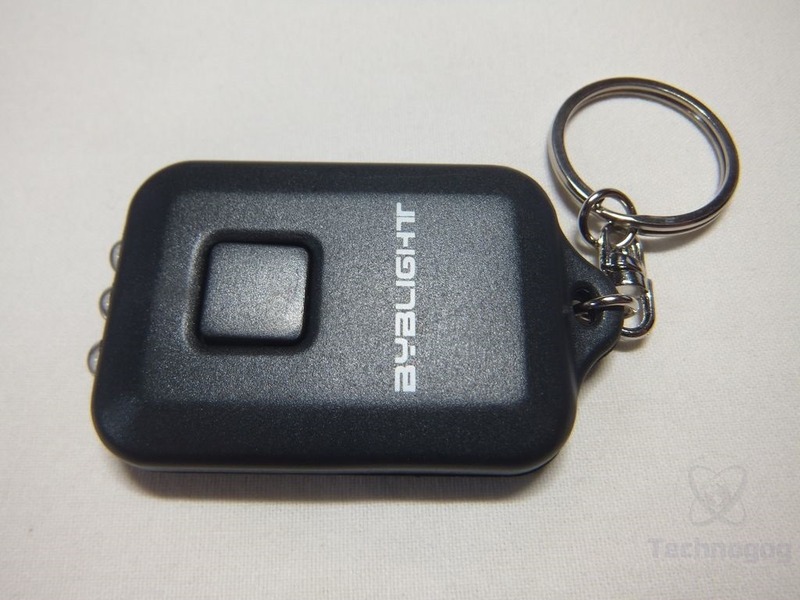 Compatible with majority of USB ports, car charger, etc. very convenient for any outdoor and indoor charging! 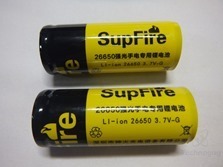 The Protected Integrated Circuit design not only prolongs the battery life, but also help prevent Anti-overcharge, Anti-over discharge and Anti-short. 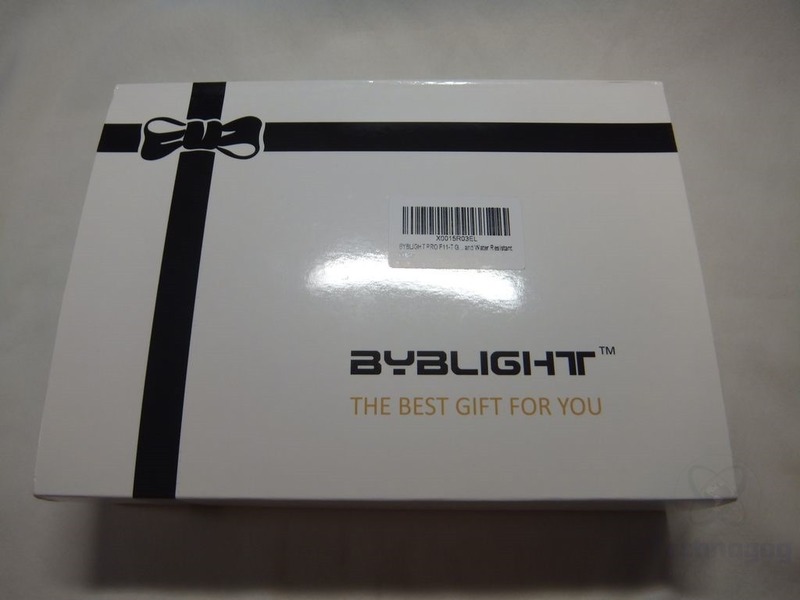 The packaging is a gist box style with slip cover over it that looks like a ribbon. When you remove the cover you’ll find the regular box with specs on I etc, and inside you’ll find everything packaged very well in foam compartments for protection. Overall it makes a very nice presentation. 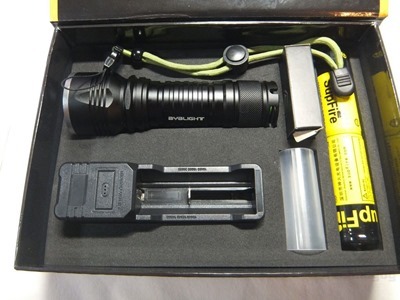 Once you get everything unpacked you’ll find the flashlight, battery charger, two batteries, two battery adapters, bonus keychain light, wrist strap and user manual. 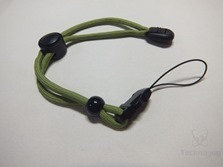 The wrist strap is very nice, it’s thick and sturdy and adjustable. 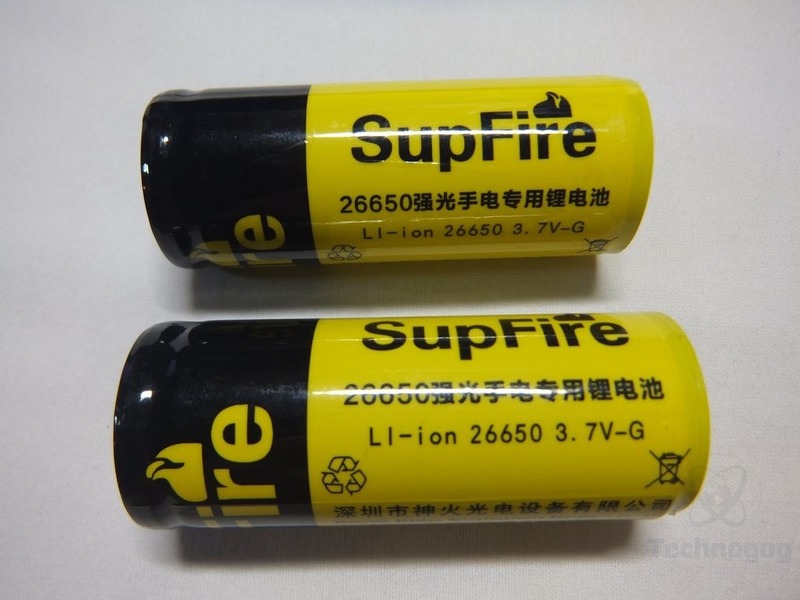 The batteries are the 26650 size so they’re rather large, they’re 3.7 volts but there is no mAh listed for capacity, they’re SupFire brand. 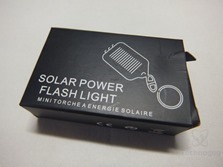 Included in the kit is a bonus item, a small solar powered keychain flashlight. 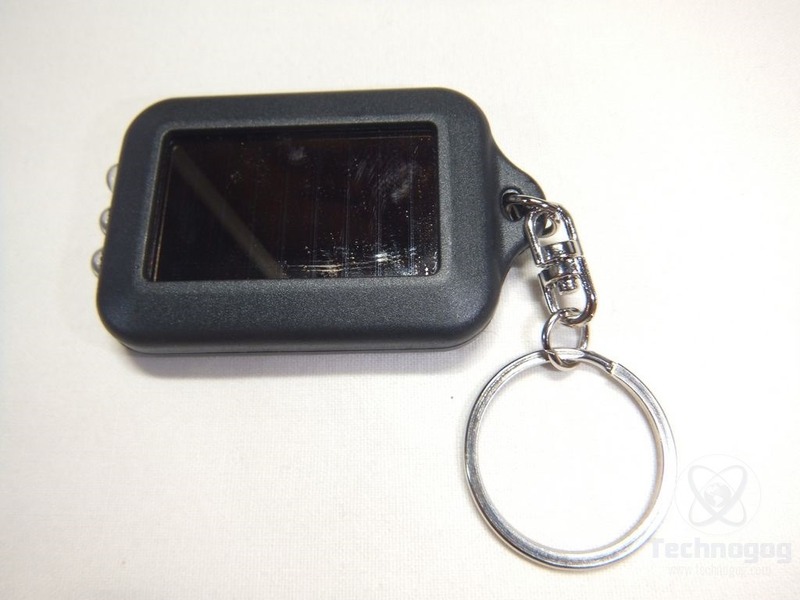 The light is about 2 inches by 1.25 by .25 inches in dimensions with a solar panel on the top, button on the bottom and three LEDs on the front end. The light is plastic yes, I’m not sure I’d want it hanging with my keys, but I’ll toss it in my glove box just in case I might need it. 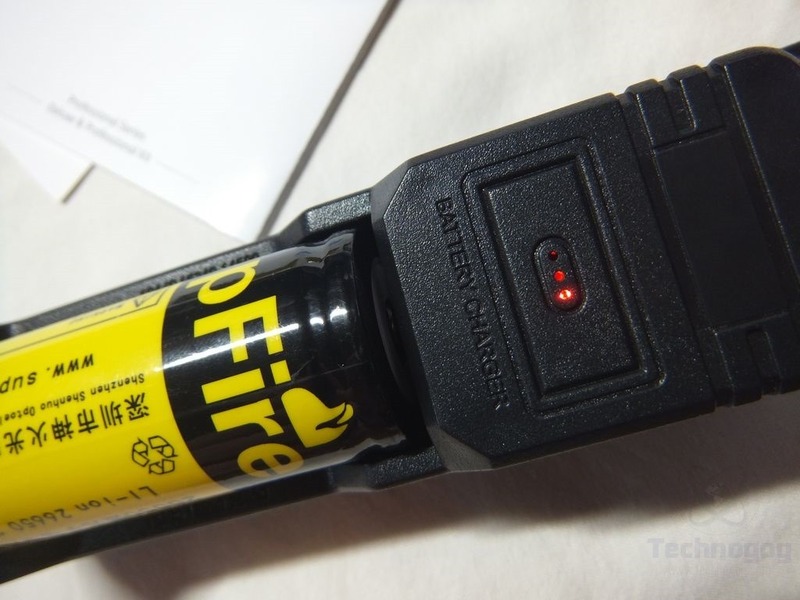 The charger looks like other battery chargers I’ve got for other flashlights, just like those for 18650 batteries but this one is powered by a standard USB connection so you can charge it from your computer or car adapter making it easy to take with you so you have power on the go. The USB cable and connector are stored in the bottom of the charger. 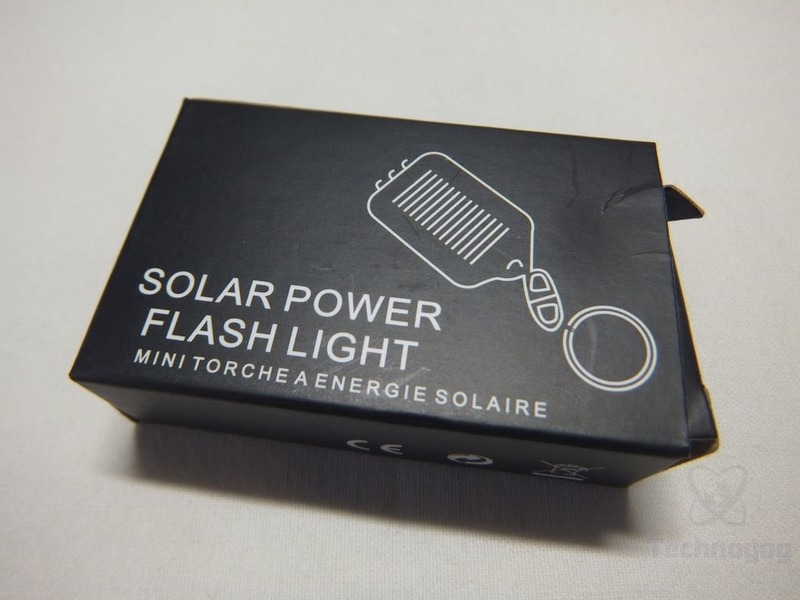 There is a small LED on the top that lights up red when charging. Specs say it’s a rapid USB charger but it doesn’t seem any faster than the other chargers I own of this style that plug into a wall outlet. You can use the charger for other batteries as well, like an 18650 battery, so the charger can be very useful. 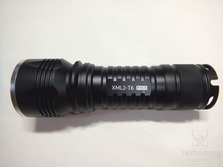 The flashlight itself is nicely made of aluminum alloy with an anodized finish, it’s black in color and it’s about 5.5 inches long and about 1.25 inches in diameter so it’s not very small, but not overly large either. The beam can be adjusted from flood to spot and in-between by sliding the front section up and down. With the front section fully extended the flashlight goes up to about 6.75 inches in length. The light is supposedly IP65 waterproof or resistant actually and dust proof. The IP 65 rating means that it’s dust proof and can withstand up to heavy rains essentially, so it’s not waterproof as it were, you can’t submerse it really. 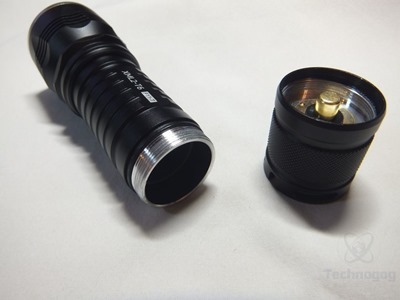 The whole light is black in color except for a silver section or ring around the lens on the front. 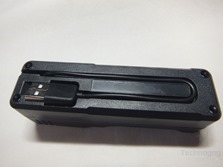 This piece can be removed to clean the lens if need be and there is a rubber O-ring inside to keep out water and dust. 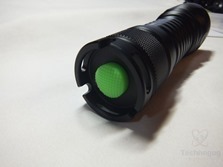 On the tail end is a green rubber covered button for power and switching modes, around the button is three sections with elongated holes in them which can be used to attach the wrist strap. The back section is flat enough that you can stand the light up and it won’t fall over. 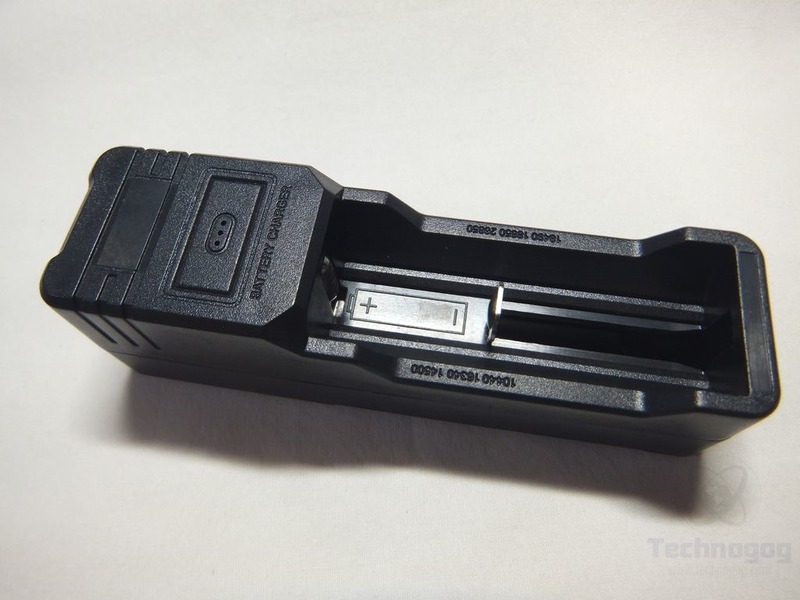 The back 1.5 inches of the light can be removed to insert the battery, it just twists on and off and inside you’ll find another rubber O-ring to further prevent dust and water from getting in the light. 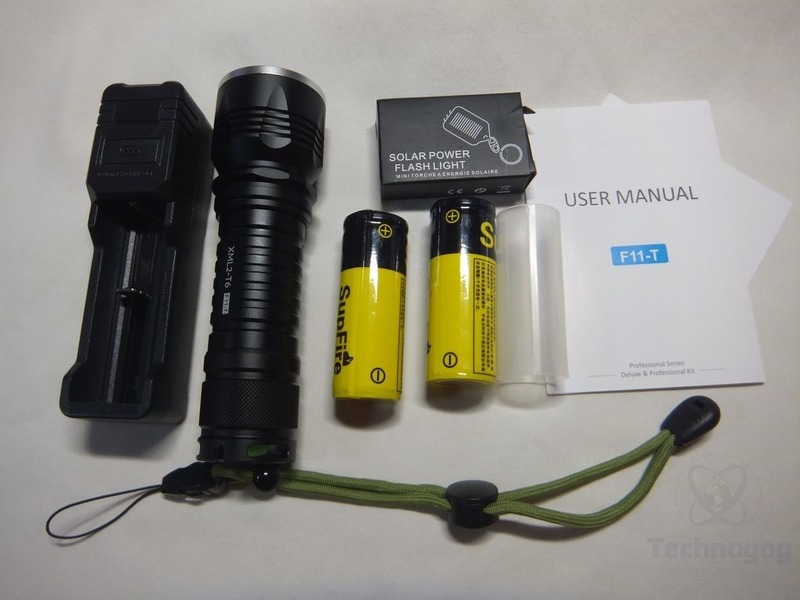 The F11-T flashlight has five modes for low, medium, high, strobe and SOS that can be changed by clicking the tail button. I used the light every night as I do with my other flashlights when I take my dogs out to do their business and it’s very bright yes but not 1200 Lumens as stated in the specs. I have another light, the Night Provision TX-11, that’s rated for 1000 lumens and when I compared them to each another at night they seemed to be the same brightness. The BYBlight is a whiter light though as opposed to the slightly yellow light of the TX-11, but they seem to be the same brightness to me. 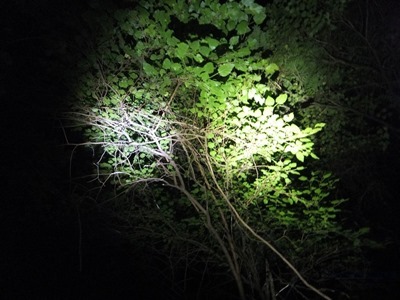 It might no be 1200 lumens as stated but it’s still blindingly bright and more than bright enough to light up the darkest areas wherever you may be. The light or throw distance is very good, it easily lights to the end of my side yard which is more than the length of my house. 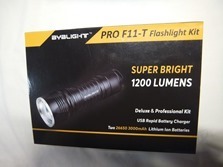 The BYBLight Pro F11-T kit is worth the money for sure, for everything you get it’s a great value kit in my opinion. 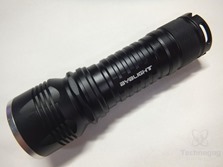 The light itself is very well made and it’s rugged and durable for sure thanks to its aluminum body. The light has rubber O-rings which help keep dust and water out so it would be fine using outdoors or taking with you camping, hiking etc or just keeping for an emergency. 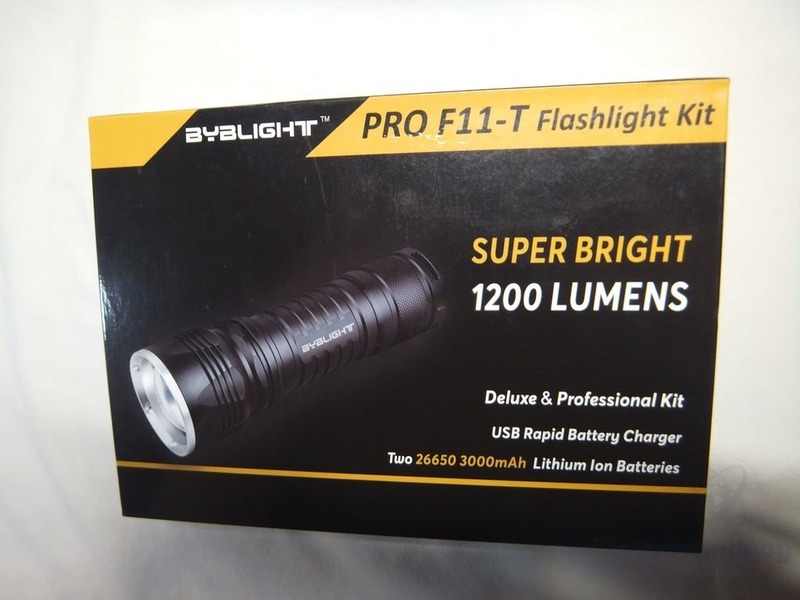 The light is bright yes but I very much question the specs of 1200 lumens as I compared to another light rated for 1000 lumens and I saw no difference in brightness. This is common though, most every light I’ve owned or reviewed was different from what it was rated for, those ratings we see on the lights don’t ever seem to be correct, but they’re close it seems. The main issue is that there doesn’t seem to be a standard for how companies measure lumens and for now we just have to deal with it I guess. The included bonus light is nice I guess, but nothing special really, it would be fine tossing in your glove compartment for emergency uses or whatever I guess.